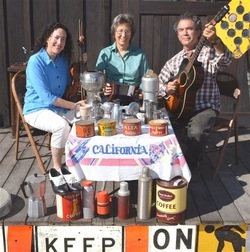 Laurie Rivin (fiddle), Janet Dows (concertina), and Paul Rangell (guitar) formed the Santa Cruz Percolators in 1986 as a contra and square dance band. This dynamic trio specializes in lively dance music gleaned from disparate sources. This event will celebrate their brand new recording - Step Out, with a dance party and concert. Expect to hear driving Quebecois reels, old-time bust down tunes and songs, and soulful waltzes, woven together with rare melodies from Trinidad, Haiti, and Puerto Rico. The second half of the evening will feature Erik Hoffman (Oakland, CA) calling square and contra dances. Don't miss this chance to spend an evening of rollicking music and dance with this notorious band of Santa Cruz locals.